Experience the impossible journey to the moon. 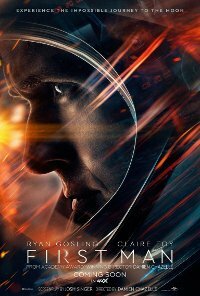 A biopic on the life of the legendary American astronaut Neil Armstrong during the years from 1961 - 1969, on his journey to becoming the first human to walk on the moon. 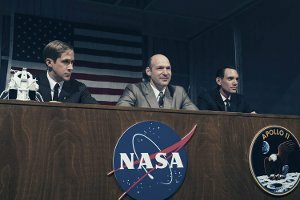 It explores the sacrifices and costs to the Nation and on Neil himself, during one of the most dangerous missions in the history of space travel. This film is releasing in 2D and IMAX. This is the IMAX version. Language Infrequent with mild to moderate impact which could be morally harmful to viewers under 13 viewers. Violence There is infrequent, low impact violence with a sense of threat or menace created by realistic visuals of space travel as determined by time and blood letting which is brief with no noticeable effect. Comments Themes are complex and mature which are explored in a biography context especially of family tensions and death and bereavement of family and friends. These are laced with mild to moderate impact threat or menace and may be disturbing and upsetting to viewers below 13 who may not be mature enough to understand the said themes and issues.